Silver Six with round window. The Silver Six (シルバーシックス) is a Japanese folding camera taking 6×6cm or 4.5×6cm exposures, made by Nippon Kōki from 1953 to 1955. The Silver Six has a horizontal body with straight diagonal struts. The combined range and viewfinder is contained in a top housing and has a common eyepiece, offset to the right as seen by the photographer. The advance knob is at the right end, the shutter release is at its usual location next to it, and the folding bed release is on the front door itself. There is an accessory shoe above the rangefinder. The back is hinged to the left and contains two red windows, one above the other; these are protected by a common cover and there is a selector switching from 6×6cm to 4.5×6cm format, controlling a secondary cover for the unused window. A removable mask was supplied for 4.5×6cm exposures. The company name NIPPON KOKI is embossed in the leather covering at the rear, and the diamond-shaped NK logo is embossed in the leather of the front door. All the models are normally equipped with a Tri-Lausar 8cm f/3.5 by Tomioka. The shutter always has a self-timer and is synchronized for flash. The plain Silver Six has a front-cell focusing lens and an uncoupled rangefinder, controlled by a wheel turned by the photographer's left thumb. The shutter is an NKS, giving B, 1–200 speeds, engraved NKS at the bottom of the speed ring and at the top of the front plate. In the advertisement placed in the January to April 1954 issues of Asahi Camera, the model is called "Silver Six with uncoupled rangefinder" (シルバーシックス単独距離計付) and the price is given as ¥13,850, case included. The picture shows a camera with lens no.2721. The camera was advertised along with the Silver Super Six up to November 1954. The early examples, as shown in the advertisement, have a round window for the rangefinder's second image and a small frame in front of the viewfinder window, with small prongs to indicate the field of view for 4.5×6cm exposures. 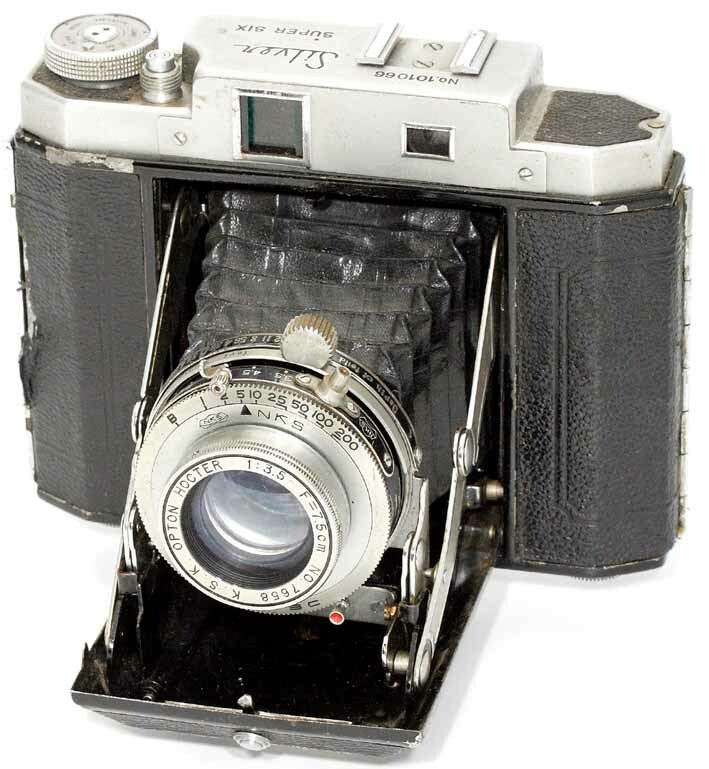 Later examples have a revised front frame patterned after the Silver Super Six, with a rectangular second image window, as on the camera pictured in the user manual. On these later cameras, the field of view for 4.5×6cm exposures is presumably indicated by translucent stripes inside the viewfinder. The Silver Super Six or Super Silver Six has a coupled rangefinder and unit focusing. The lens and shutter unit is mounted on a helical with a round focusing tab. The second image window is rectangular, and the name Silver SUPER SIX is engraved on the top housing, together with the body serial number. There are translucent red or green stripes in the viewfinder, indicating the field of view for 4.5×6cm exposures, which are perhaps also present on the plain Silver Six. The camera is mentioned as the "Super Silver Six" (スーパーシルバーシックス) in a leaflet advertising the Silverflex Model S and other products by Nippon Kōki, reproduced at the bottom of the page. The document makes no mention of the year, though it was surely published in 1953. It says that the camera would be released in July for ¥19,800, and mentions a Congo f/3.5 lens and an NKS shutter (whose top speed is wrongly stated as 1/250). The Congo lens — made by Yamasaki — might have been used on the earliest examples, but all other documents show the camera with a Tri-Lausar 8cm f/3.5 by Tomioka. The camera first appeared in Japanese photography magazines in October 1953. In the new products column of the January 1954 issue of Asahi Camera, reproduced above, it was featured as the "Super Silver Six". The document says that this model was launched after the plain Silver Six, and produced from late 1953 in a newly opened plant in Setagaya, Tokyo. The camera is presented as the first low-price folding camera equipped with a coupled rangefinder. The rangefinder coupling mechanism was kept simple, with no rotating parts, and a patent was applied for by the company. Two optical elements are placed in front of a fixed second-image mirror; the convex front element is fixed and the concave rear element moves laterally, thus deflecting the light path. Finally, the shutter is described as an NKS (B, 1–200). In the advertisement placed in Asahi Camera from January to April 1954 — already cited above — the camera is simply called "Silver Six with coupled rangefinder" (シルバーシックス連動距離計付). The document mentions B, 1–200 shutter speeds and gives the price of ¥19,850. The picture shows a camera with lens no.2260. Surviving examples are known with various types of shutter. The example pictured in Sugiyama has a plain NKS (B, 1–200) with an ASA synch post, engraved NKS at the bottom of the rim and at the top of the front plate. Another camera has a plain NKS with a PC synch post. Finally, at least one surviving camera is known with a Copal shutter (B, 1–300) and a PC synch post. The Silver Super Six was replaced by the Calm Six in mid-1955. ↑ 1.0 1.1 Advertisement in Asahi Camera January 1954, p.187, February 1954, p.75, March 1954, p.51, and April 1954, p.167. It is also reproduced in Kokusan kamera no rekishi, p.140, and in this page at Shashin-Bako. ↑ User manual of the Silver Six, Japanese language, reproduced in this Flickr album by Rebollo_fr. ↑ Kokusan kamera no rekishi, p.352. ↑ 4.0 4.1 4.2 Column in Asahi Camera January 1954, pp.214–5. ↑ Example pictured in Sugiyama, item 1418. ↑ Silver Super Six serial no 101915, offered as lot no.723 of Westlicht Photographica Auction no.7 (21 May 2005) and sold as lot no.792 of Westlicht auction no.15 (23 May 2009), and other examples observed in online auctions. ↑ Example pictured in the AJCC website. ↑ Example pictured in this page at Rolling-life. Nippon Koki Co., Ltd. Silverflex Model S. Leaflet published c.1953, date not indicated. Contains some information on other products by Nippon Kōki, including the Silver Six. Document reproduced in this Flickr set by Rebollo_fr. Nippon Koki & Co., Ltd.. User manual of the Silver Six, in Japanese language, published c.1954. Document reproduced in this Flickr set by Rebollo_fr. Asahi Camera (アサヒカメラ) editorial staff. Shōwa 10–40nen kōkoku ni miru kokusan kamera no rekishi (昭和10–40年広告にみる国産カメラの歴史, Japanese camera history as seen in advertisements, 1935–1965). Tokyo: Asahi Shinbunsha, 1994. ISBN 4-02-330312-7. Items 537–8. Lewis, Gordon, ed. The History of the Japanese Camera. Rochester, N.Y.: George Eastman House, International Museum of Photography & Film, 1991. ISBN 0-935398-17-1 (paper), 0-935398-16-3 (hard). P.83 (brief mention only). Sugiyama, Kōichi (杉山浩一); Naoi, Hiroaki (直井浩明); Bullock, John R. The Collector's Guide to Japanese Cameras. 国産カメラ図鑑 (Kokusan kamera zukan). Tokyo: Asahi Sonorama, 1985. ISBN 4-257-03187-5. Item 1418. This page was last edited on 30 August 2017, at 10:42.